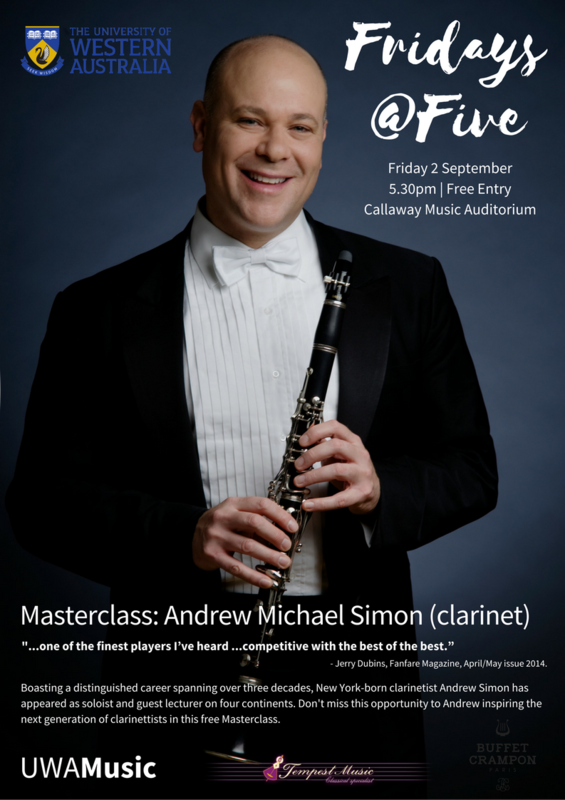 Internationally renowned clarinettist Andrew Simon, Principal Clarinet of the Hong Kong Philharmonic will be performing and working with UWA clarinet students in a free masterclass. 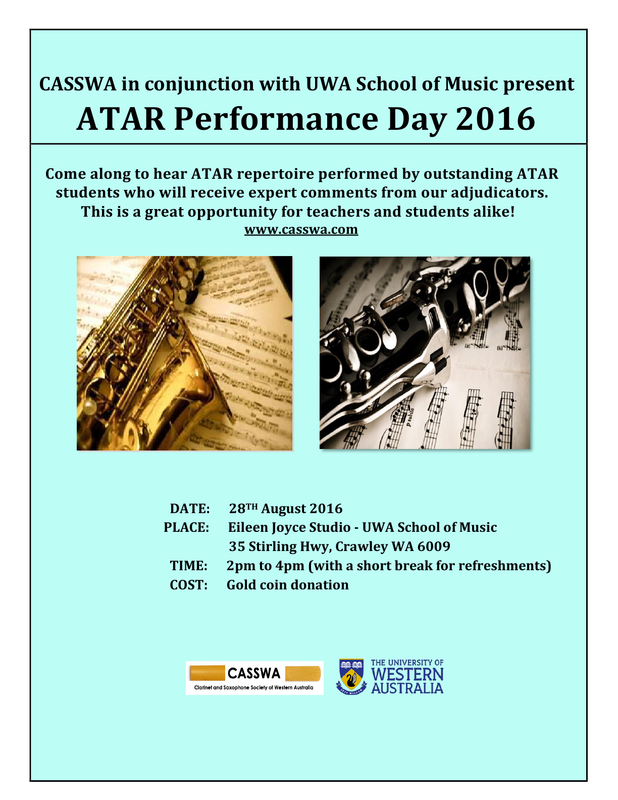 Come along to hear ATAR level repertoire performed by outstanding students with expert comments from our adjudicators… a great opportunity for teachers and students alike! THIS Sunday 22 May at 3pm, Ashley Smith will be presenting a recital in the Callaway Auditorium at UWA. Centred around Ashley’s research on the 20th century Italian composer, Franco Donatoni, the program consists of clarinet and bass clarinet works of extreme virtuosity. The recital shall include the Australian premiere of a solo work by Donatoni alongside the premiere of a new version of Magnus Lindberg’s Ablauf for clarinet with electronic sampling devised by Chris Tonkin. Other works include Berio’s Sequenza IX, Bartok’s Contrasts and Rossini’s Introduction, theme and variations. Lachlan Skipworth’s beautiful the night sky fall shall also be performed. Joining Ashley will be Shaun Lee-Chen (violin), Gladys Chua (piano), Louise Devenish (percussion), Emily Green-Armytage (piano), Lachlan Skipworth (composer / conductor) and Chris Tonkin (composer / electronics). The program is hard-edged, but promises to be extremely exciting. Entry is free! Join fellow clarinet and saxophone enthusiasts at CASSWA’s eighth annual ClariSaxFeast. CLARISAXFEAST 2016 and featured guest artist Mark Walton will present ensembles, workshops, master classes, displays and performances for clarinet and saxophone enthusiasts of all ages. Be sure to bring your instrument! Entry to ClariSaxFeast automatically includes CASSWA membership until May 2017. Experience the phenomenal power of Strauss’ majestic musical sunrise. Richard Strauss’ awesome opening ‘Sunrise’ fanfare is still one of the most powerful and recognisable moments in orchestral music. Used by the BBC in their coverage of the Apollo Moon landings, Also sprach Zarathustra holds the power to profoundly move you with its strength and optimism while painting a picture of the vastness and possibility of the universe. To complement Strauss’ musical and philosophical masterpiece, Principal Conductor Asher Fisch has chosen two more great Romantic works: Schumann’s noble Second Symphony and the triumphant Overture from Wagner’s Tannhäuser. WASO is pleased to offer you 2 FOR 1 tickets to Asher Fisch Conducts Strauss – Zarathustra this weekend. Pay only $96* for two Standard A Reserve seats instead of $192 – that’s a saving of $96! To take advantage of this offer and save 50% on regular ticket prices on any remaining Standard seats in A and B Reserve*, click here to book online or call WASO on 9326 0000 quoting the promo code 1590. 2-FOR-1 offer available on Standard A & B Reserve tickets only. *A one-off handling fee of $5.50 per transaction applies to all purchases. An additional fee of $3.20 per transaction applies for delivery via Registered Post.